Parallels 3.0 Beta 2 (Build 5120) came out the other day. I updated my copy and checked to see if they had fixed the problem I've been seeing with Linux VMs assigned more than 512MB. Unfortunately, they haven't. 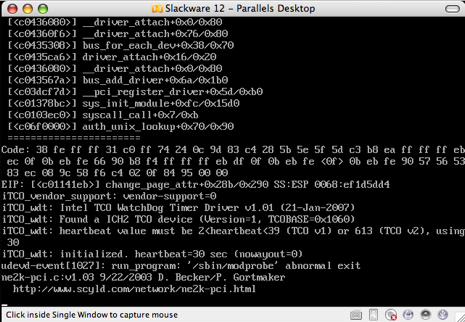 I'm running Slackware 12.0 in a Parallels VM with a vanilla 2.6.21.5 kernel. If I assigned that VM 512MB of RAM it runs just fine. If I give it 768MB or 1024MB, modprobe crashes on startup. Set it back to 512MB and it's happy again. I've seen other people have similar issues trying to get Parallels to run the server version of Ubuntu. Parallels doesn't have this restriction with a Windows XP VM, so it has to be something they aren't emulating correctly for Linux. It makes me wonder if I ought to have waited for VMWare Fusion, as I use VMWare Workstation at the office a lot, but the beta wasn't even out when I bought Parallels. Ah well, 640KB512MB should be enough for anyone, eh?